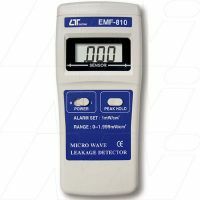 This meter is specially designed for measuring or monitoring electromagnetic field value for the micro-wave frequency. The equipment can be used to detect the leakage of a microwave oven. 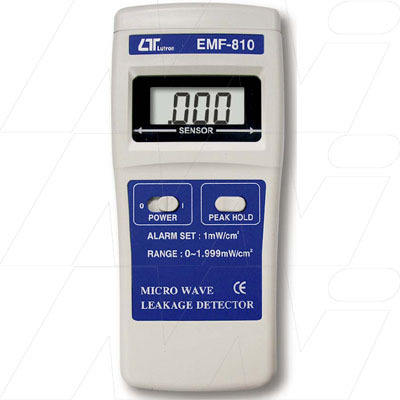 The equipment can also measure the radio EMF values for hospital equipment, radar, radiation work, TV antenna, Radio station , welding equipment , baking- equipment, televisions and computers. electromagnetic field value for the micro-wave frequency precisely. value ( leakage value ) is larger than the safety level. * The meter have been calibrated precisely on the frequency value 2.45 GHz. * Peak hold function to latch the max. measuring value. * Powered by 006P 9V battery and DC 9V adapter. Display LCD size : 40 mm x 25 mm. Digit size : 12 mm x 6 mm. measured, but for reference only. * measurement level is 0.1 mW/cm^2. Peak Hold To latch the max. measuring value. Over Indicator Display shows " OL ". Power Current Approx. DC 1.86 mA. Weight 202 g/ 0.445 LB. Dimension 152 x 69 x 36.3 mm. (6.0 x 2.7 x 1.4 inch). Standard Operation Manual............................................ 1 PC. Optional Soft carrying case, CA-52A.